You are currently browsing the archives for the "AB" tag. 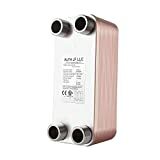 Built with high quality stainless steel 316L and 99.9% copper, these plate heat exchangers produce a counter-current flow to maximize heat efficiency. This domestic hot water heat exchanger is highly efficient due to the corrugated plates which produce a high, turbulent flow in a true counter-current direction. With their compact size and reduced material content, they can be the most economical heat transfer choice.